Lubricants for the perfect experience with your FLIP-AIR. 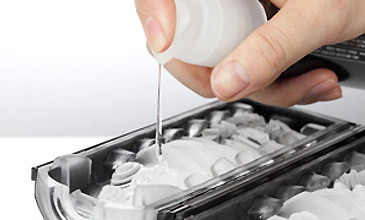 The push faucet lets you easily control the amount of lubricant you use. We recommend 5 pushes. With the easy - to - spread lubricant, you can enjoy a smooth glide with only a small amount, meaning it won’t dull each interior detail, providing stimulus like it was designed to give - every time. MELTY WHITE for a smooth, fluid sensation. SOLID BLACK for a direct, invigorating stimulation.